For years, Bryson City’s Fourth of July fireworks show has been one of the best in the Western North Carolina mountains, the culmination of “Freedom Fest“, the town’s old fashioned Independence Day celebration. The day begins with a 5K race, includes music, food and crafts before ending with the fireworks. 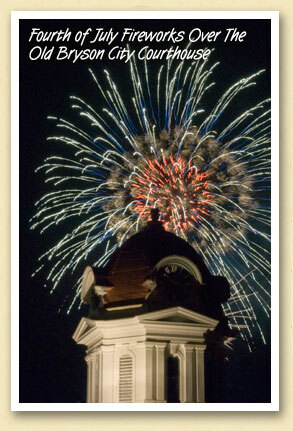 Above, the dome of Bryson City’s century-old courthouse building is silhouetted against last year’s pyrotechnics.